Emerging choreographers Samantha Allen, Hope Goldman, and Jessie Young will debut a trio of new pieces tonight for two free performance programs titled Out on a Limb. Created in collaboration with and performed by dancers Lindsay Reich and Katie Jean Dahlaw, Allen's KJ&L explores the relationship between performers as well as with the audience. With a sound score designed by Casey Swoyer, the performance combines abstract movement and references to other dance forms in search of meaning found through movement. Influenced by the Occupy movement, Goldman's People Power features three dancers (Erin Sansone, Cara Newman, and Isabelle Collazo) in negotiation with their role within late capitalism's influence. Finally, Nebi Berhane will perform a solo titled Thick Without and choreographed by Young. The work is influenced by a quote from the choreographer's mother and will highlight space, movement, and stillness in dance. 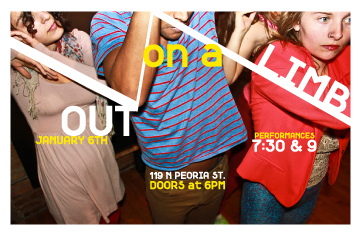 Out on a Limb takes place tonight at 119 North Peoria, #3B. Recent sculpture work from William W. FitzPatrick and photographs from Jessie Young will also be featured in the performance space. Doors open at 6pm. Performances begin at 7:30pm and 9pm.